Drawn to Central Oregon’s sunshine and small-town vibe, Matt Gilman moved from the San Francisco Bay Area to Central Oregon in September to open his specialty sock company, Chivaz Wear LLC. It’s a common story for Bend transplants, but Gilman landed 17 miles to the northeast in Redmond. “I had never heard of Redmond before, but it just felt like this great combination of activities,” Gilman said. Having moved from Silicon Valley, Gilman said he was looking for a lifestyle change, and ultimately he found Bend too upscale and congested to be a good fit for him to start his company. Redmond, smaller and more affordable, stood out. While Chivaz Wear is still a fledgling startup, he said his colorful, stylized socks can be found in around a dozen stores in Central Oregon and California, and he’s attempting to get a subscription service off the ground. Additionally, Gilman said he was committed enough to Redmond that he and his wife bought a house in the city. Gilman isn’t alone. Like its neighbor to the south, Redmond has largely shaken off the aftereffects of the Great Recession. Housing prices for single-family homes grew by more than 14 percent in Redmond between 2014 and 2015, compared to just under 13 percent in Bend over the same period, according to Economic Development for Central Oregon. Redmond’s industrial buildings have filled up as well; the vacancy rate for such buildings has dropped for seven consecutive quarters. And existing companies are hiring. According to numbers provided by the Oregon Employment Department, 796 help-wanted advertisements for jobs in Redmond were posted across various mediums in April, up more than 6 percent over the previous April. “There’s this sense that everything’s Bend-centric, and that’s just not the case anymore,” said Damon Runberg, regional economist for the Oregon Employment Department. Along the same lines, the city’s unemployment rate stood at around 5 percent, comparable to the rate in Deschutes County overall, according to Jon Stark, Redmond area manager for EDCO. “We’re in the shadow of Bend, but we’re trying to shape our own shadow,” Stark said. Like Bend, Redmond was hit hard when the lumber mills began to close in the 1980s. 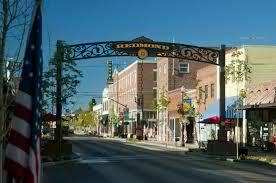 Redmond Mayor George Endicott said the city once had five working mills, which focused primarily on interior wood molding for houses. While a handful of lumber companies maintain a presence in Redmond, Endicott said the industry has declined sharply over the past three decades. While Bend was able to parlay its location and climate into vibrant tourism-related industries, Redmond, smaller and farther from some outdoor amenities, had less success in that sector. As a result, the city had to look to other industries. “We’re not really a tourist town; we’re a manufacturing and industrial town,” Endicott said. From 2010 to 2014, Redmond’s manufacturing employment grew by more than 26 percent, comparable to the overall numbers from the Bend-Redmond Metropolitan Statistical Area, which comprises all of Deschutes County. Runberg acknowledged that the growth was a bit deceptive, given Deschutes County’s severe manufacturing job losses leading up to 2010, but Redmond’s growth in manufacturing jobs over that period was nearly three times the rate in Oregon overall, and more than four times the national rate over the same period. Stark added that this growth was due primarily to gains from the city’s large manufacturers. “These are the companies that were here, and were very resilient during the recession, and once that ended, they started to grow,” Stark said. One such company is PCC Schlosser, the Redmond-based subsidiary of Portland manufacturer Precision Castparts Corp., which topped the list of private companies sending out help-wanted ads in April. Lisa King said the company has nearly doubled since 2009, and currently employs 358 people in Redmond after several years of rapid growth. Redmond has also attracted manufacturers that are looking for a city with lower industrial land costs than Bend. One such company was the Central Oregon bullet and ammunition manufacturer Nosler Inc., which purchased 60 acres of land for a new manufacturing plant in Redmond at the beginning of 2015. Zach Waterman, public relations manager for Nosler, said 11 employees currently work in Redmond, and the company will be hiring nine new employees in the city. “It was just the right fit for us,” Waterman said of Redmond. Stark, who worked with Nosler on the deal, added that the lower cost of land played a role in the company’s decision. While Redmond’s relative affordability compared to Bend certainly plays a role in companies choosing to move and stay in the city, there are other factors as well. Patsy Bartelson, who founded Straw Propeller Gourmet Foods in Redmond, cited easy access to the only commercial airport in Central Oregon as an advantage, as it allows her and her employees to more easily attend trade shows and other events. Additionally, she said the city’s centralized location within the region makes it easier to attract employees from outlying areas. She said that the majority of Straw Propeller’s 15 employees are from Redmond, but workers also commute from Madras, which would be more of a challenge if the company were located in Bend. Bartelson added that the smaller community can be more flexible to accommodate businesses that are trying to move into new spaces within the city. In 2015, Straw Propeller moved from a smaller location in Redmond into its current facility, which has 15,000 square feet of manufacturing space. “You really get the sense that they want you to be there and want you to be successful,” Bartelson said. Despite the growth, Redmond still faces problems. Stark said the city was running low on available industrial space, and struggling to keep up with demand. He said there are fewer than 10 industrial buildings with more than 3,000 square feet left in the city, and a vacancy rate of around 5 percent for industrial buildings overall. Additionally, Chuck Arnold, economic development and urban renewal coordinator for Redmond, said the city lacks a boutique hotel that can keep visitors downtown, making it harder for local companies to entertain clients. Arnold added that the city is in talks with clients who could restore the Historic Redmond Hotel, on SW Sixth Street. “The building is really well-positioned to be successful,” Arnold said. In general, Arnold, who worked for the Downtown Bend Business Association for a decade before taking a job in Redmond in 2015, said the goal was to continue to cultivate a walkable, family-friendly environment throughout the city. “Redmond wants to be this first-choice, family-oriented community, and I really relate to that,” Arnold said.